(l-r) Pam Cosper, nursing speciality director for critical care services; Martha Boudreau, CCU nurse educator; Wilma Foreman, nurse scholar and Michelle Gray, former CCU unit director. 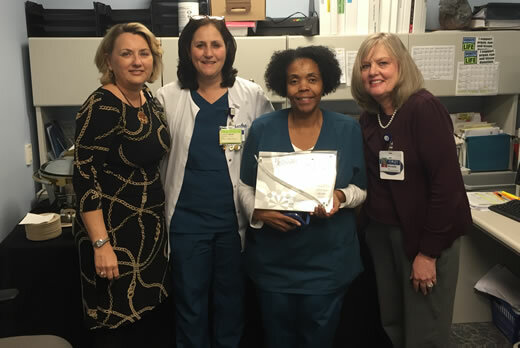 The American Association of Critical-Care Nurses (AACN) has awarded a silver-level Beacon Award for Excellence to the nursing staff on 3G/4G Coronary Care Unit (CCU) at Emory University Hospital. This is the second Beacon Award for this unit. The Beacon Award for Excellence - a significant milestone on the path to exceptional patient care and healthy work environments - recognizes unit caregivers who successfully improve patient outcomes and align practices with AACN’s six Healthy Work Environment Standards. Units that achieve this three-year, three-level award with a gold, silver or bronze designation meet national criteria consistent with Magnet Recognition, the Malcolm Baldrige National Quality Award and the National Quality Healthcare Award. "Units that receive the Beacon Award must maintain the highest levels of performance and provide consistent high-quality patient and family care, research, innovation and positive patient outcomes," says Martha Boudreau, APRN, MN, CCRN, nurse educator on the Coronary Care Unit at Emory University Hospital, and lead nurse on the Beacon Award application. "Our nurses are highly qualified, highly educated and highly motivated. The patients admitted to our CCU can expect to receive only the highest level of care from the nursing staff." Unit 3G/4G Coronary Care Unit, a 14-bed unit located across two separate floors of the hospital, is staffed with 45 registered nurses. Three of those nurses have a Master’s degree in nursing and 31 others have Bachelor’s of Science in nursing degrees. Fifty percent of the staff has been certified in critical care. "Obtaining this award for a second time has given the 3G/4G CCU nursing staff the national recognition they deserve," says Pam Cosper, MSN, nursing specialty director for critical care services at Emory University Hospital. "They can take pride knowing they are recognized as top notch nurses working in a Magnet-designated hospital where all patients receive the best care possible." Three other critical care units within Emory Healthcare are current Beacon Award holders. They include: the Neurosciences ICU and the Medical ICU at Emory University Hospital and the Medical ICU at Emory University Hospital Midtown. The American Association of Critical-Care Nurses is the largest specialty nursing organization in the world. Established in 2003, the Beacon Award for Excellence offers a road map to help guide exceptional care through improved outcomes and greater overall patient satisfaction.